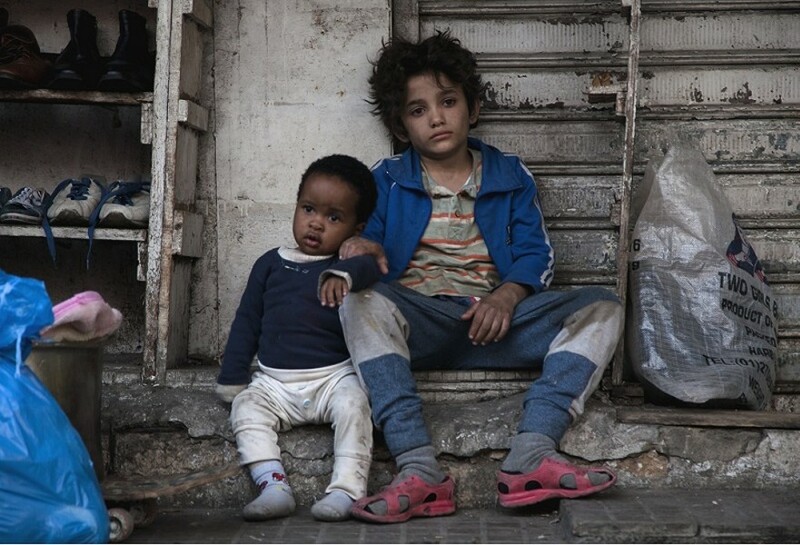 PHOTO COURTESY SONY PICTURES CLASSICS Zain Al Rafeea and Boluwatife Treasure Bankole in "Capernaum." One of five films nominated for Best Foreign Language Film at this year's Academy Awards, the Lebanese drama "Capernaum" is a sometimes heavy-handed, but nonetheless powerful tale of poverty and adversity, written and directed with unflinching naturalism by Nadine Labaki. The film opens as streetwise youth named Zain (Zain Al Rafeea) is brought before a judge in a crowded Lebanese courtroom. He guesses that he's 12, but is so frail he appears much younger. He's been jailed for attempted murder, but is now the plaintiff in a lawsuit against his parents. Their much more serious crime, he claims, was giving birth to him; bringing him into a world so harsh and unforgiving that he never stood a chance. From there, we spring backward to see Zain's life and the circumstances that led him to this dire place. We see him living in a cramped apartment in the slum of Beirut with his neglectful parents and several siblings, forced to fend for himself selling juice on the street. He seems indifferent to most of his family (and they to him), but he's fiercely protective of his 11-year-old sister, Sahar (Cedra Izam). When Sahar gets her period, Zain grows worried that her blossoming womanhood means that she'll be sold into a marriage to middle-aged shopkeeper Assaad. He tries desperately to prevent this from happening, but as things play out exactly as he feared, he reaches his limits and runs away. He takes temporary refuge at an amusement park and is eventually befriended, then taken in by one of the workers, an Ethiopian migrant worker and single mother named Rahil (Yordanos Shiferaw) who invites him to stay with her and her toddler, Yonas (the remarkable Boluwatife Treasure Bankole). But as an undocumented migrant, Rahil is herself subject to the manipulations of the authorities and unscrupulous predators of the street. The film's title comes from the name of an ancient Israeli city, which over time has become a term meaning disorder and chaos, a constant way of life for those in the film's Beirut underbelly setting. It's a place crowded with refugees, many fleeing the war in neighboring Syria. These undocumented migrants lead impossible lives, ever vulnerable to individuals more than willing to take advantage of their situation. As a plot device, Zain's lawsuit itself is not entirely convincing; it never feels like something the boy might actually see as a possibility. As a framing story, it lets the audience know that Zain makes it through his ordeal alive, though it muddies the audience's sympathies, asking us to both to root for Zain and think that the easiest way for him to avoid all that suffering would have been if he'd never been born in the first place. Labaki aims for empathy, but in so stacking the deck against Zain, the emotion she stirs up too often feels like pity. The journey we take with Zain can be unduly grueling -- the narrative constantly teeters on the brink of miserabilism -- but thankfully Labaki provides moments of tenderness and finds ways to inject small bits of humor when she can. Most of all, it helps that the film is built around an incredible, singular performance from Zain Al Rafeea as Zain. The young actor is an unforgettable, charismatic presence. His is a performance I can easily see coming up in future discussions about all-time great work by child actors. It's because of him that we can look past the manipulations of the film's script to find a powerful story of one extraordinary boy's enduring will to survive. Movie Previews Film Film preview "Capernaum"